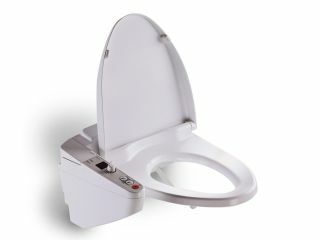 We know how much you guys dig those crazy Japanese toilets, so are elated to break the news that Panasonic has just raised the bar by introducing an intelligent dunny that keeps an eye on its users. The Beauty Toilette WA, which is due out next week starting at ¥60,000 (£305), has a sensor built into its base that scans the smallest room for body heat. When it recognises the presence of a person, it not only starts rapidly heating the seat, but it also puts the kettle on to prepare some hot water for the Washlet bidet function. Best of all, the standby mode uses around half the power of conventional models. Which begs the question of when we in the West will start worrying about the power-guzzling standby habits of our toilets too.